These words by G.K. Nelson ring true for Sanala Nikitha, a L’Oréal India For Young Women in Science Scholarship recipient. A girl from a lower middle-class family in Telangana, Sanala faced numerous financial challenges in her journey. She had an interest in Electronics and is now pursuing a professional course in the same field. This wouldn’t have been possible without her determination and a strong work ethic. We had a word with her in the hope of getting to know her a little more. Below are the excerpts from our conversation with her. 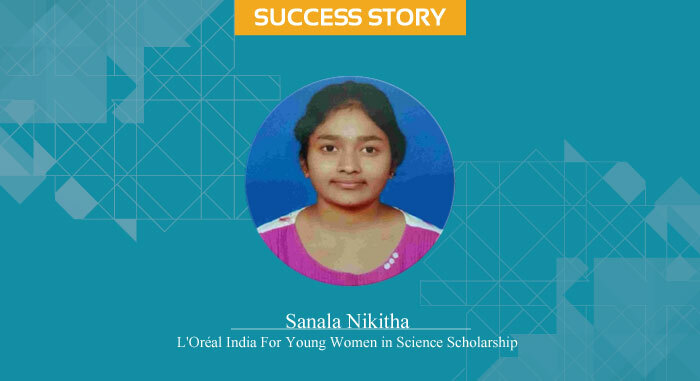 Here is the Scholar Success Story of Sanala Nikitha. Buddy4Study: Tell us about your academic background and professional journey till now. Sanala: I have done my matriculation from Shree Hanuman Vyayam Shala High School, Hyderabad, Telangana and Intermediate from Sri Chaitanya Junior Kalasala, Archana Complex, Ranga Reddy, Telangana. I scored 9.5 GPA out of 10 in S.S.C Board Examination conducted by the Board of Secondary Education, Telangana and 96% in Intermediate Board Exams conducted by the Telangana State Board of Intermediate Education. I also qualified the State Engineering Entrance Exam (T.S. EAMCET) with a decent rank that helped me get admission in Vignana Bharathi Institute of Technology, Ghatkesar, Telangana which is one of the top colleges in Telangana to pursue B.Tech. in ECE stream. Buddy4Study: Why did you choose to pursue B.Tech. in ECE? Sanala: As a child, I was fascinated by Engineering studies. I chose to pursue B.Tech. in ECE because of a particular interest in Electronics. I believe it is a core subject which offers enormous job opportunities in hardware or software field as this degree is a combination of both hardware and software. So, I decided to pursue B.Tech. in Electronics and Communication Engineering to have a bright future in terms of job as well as Masters studies. Buddy4Study: What were the challenges that came across your way during this journey? Sanala: I belong to a lower middle-class family. After securing a seat based on merit, I needed financial assistance to pursue my Electronics and Communication Engineering course. Although my parents always supported me, they couldn’t provide financial support towards my higher education due to low family income and the poor financial condition of our family. Taking care of my educational expenses and worrying about the financial aspect of College was a major challenge for me. Buddy4Study: Who has been your source of inspiration? Sanala: My parents have been the biggest source of inspiration for me. They have worked extremely hard in order to provide me a better future. I aim to make them proud by reaching great heights in future and earning a good name for myself in society. So, I decided to be persistent and determined to achieve my career aspirations. Buddy4Study: How did your family support you in this journey? Sanala: I would not be at this level in my education without the support of my family. In spite of all the financial and other difficulties faced by my family, my parents always encouraged me and my brother for accomplishing our educational goals. They provided us support at all times. Buddy4Study: How did you come to know about the L’Oréal India For Young Women in Science Scholarship? What were the steps involved to avail the scholarship? Sanala: I wish to express my deepest gratitude to Buddy4Study. It was because of them that I came to know about the L’Oréal India For Young Women in Science Scholarship. So, I applied for the scholarship and fortunately got shortlisted for the telephonic interview. On clearing the telephonic interview round, I got shortlisted for the final interview conducted by a jury consisting of eminent members of the scientific and academic communities along with L’Oreal India representatives. I cleared the final round as well and got selected for the scholarship. Writing the essay and giving an interview was a big learning experience for me. Buddy4Study: What are your future plans? How will you execute those plans? Sanala: After graduating, I would like to get placed in one of the top MNCs that offer good packages. This would help me support my family. I even have plans of getting into one of the PSUs like GAIL, BHEL, ECIL, etc by appearing for GATE examination. But first, I need to complete my engineering to achieve these goals. Buddy4Study: What would be your advice to other potential aspirants? Sanala: My advice to potential aspirants is that poverty or any other challenge wouldn’t be a roadblock in accomplishing your educational goals because of the foundations such as Buddy4Study who care for the students by providing constant support. The only thing that matters is how strong are your career goals and how persistent and determined are you to achieve them. Finally, no one can separate the best pair in this world – success and hard work.